This 3 in 1 certified ORGANIC mask detoxifies, exfoliates and softens the skin in a single step. Its formula enriched in scrubbing agents encourages skin regeneration for a « new skin effect ». Tested under dermatological control. 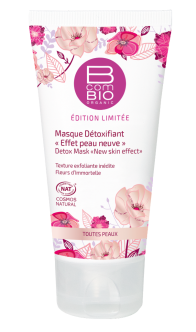 This certificated organic 3 in 1 mask detoxifies, exfoliates and softens the skin in a only one gesture. Its exfoliating actives enriched formula stimulates the skin regeneration for an immediate « New skin effect ». Apply in a thick layer on the face, then massage. Leave on for five minutes, then rinse. In contact with water, it becomes a smooth milk. Use once to twice a week. Avoid eye contour. External use. Organic Oleic Sunflower Oil *, Natural Oils **, Water, Glycerin **, Organic Rice Powder *, Emulsifiers **, Fragrance, Blueberry Extract **, Strawberry Seed Powder **, Camellia Oil **, Helichrysum Extract **, Daisy Flower Extract **, Organic Hibiscus Flower Extract *, Sugar Cane Extract **, Orange Extract **, Lemon Extract **, Maple Extract Sugar **, Gramil Root Extract **, Vitamin E **, Organic Jojoba Oil *, Sunflower Oil **, Mica, Preservatives, Nacres, pH Adjusters. 28% of the total ingredients are from organic farming. For a deeper moisturization, apply Moisturizing Serum after your scrub.This certificated organic 3 in 1 mask detoxifies, exfoliates and softens the skin in a only one gesture. Its exfoliating actives enriched formula stimulates the skin regeneration for an immediate « New skin » effect.